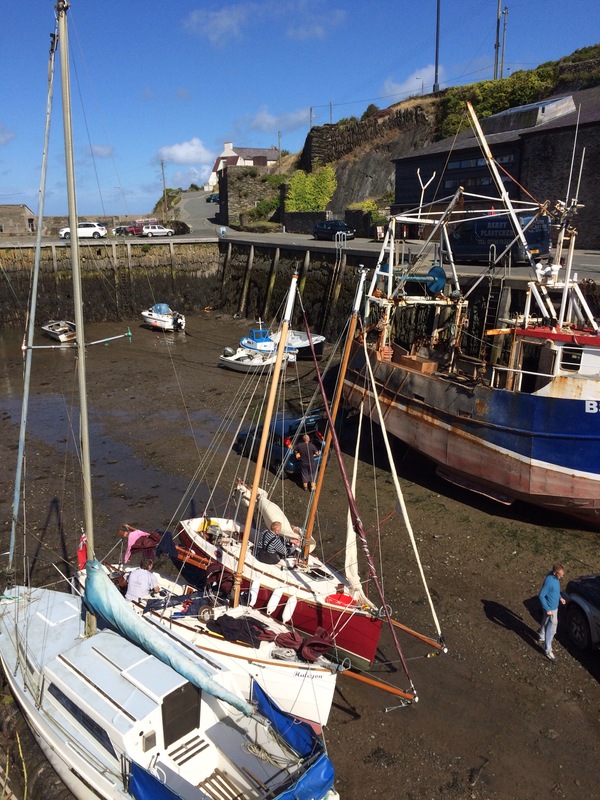 We left Amlwych on Saturday morning as soon as the boats were afloat. 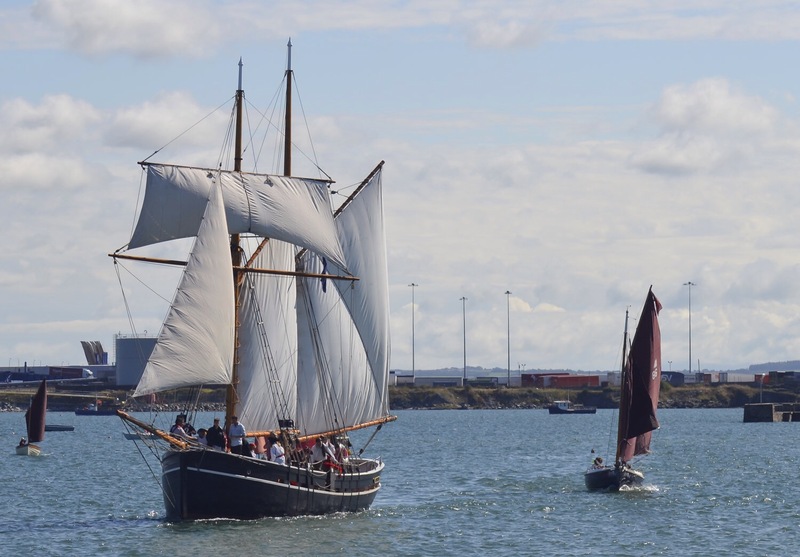 The four Cape Cutters – Aurora, Fraoch, Halcyon and Salty Dog – were en route to Holyhead for the traditional boat festival in Holyhead. Between our haven at Amlwych and our destination was the tidal gate of Carmel Head, which has quite a reputation. The tide is funelled past this corner of Anglesey at a phenomenal rate, which creates large overfalls when the tide is moving. It’s therefore important to turn this corner at slack water. We had worked out that we had just enough time to get there for slack water. However Henry Honda threw a spanner in the works by coming to an abrupt halt a short distance out of the harbour. We had been disappointed not to be able to reach Holyhead the day before and wanted to join in the festivities today so, with three others accompanying Aurora, I decided to press on. It was a lively fetch along the North coast of Anglesey, though less windy than the day before. Two reefs in the main seemed a little conservative at first, but the wind began to build as forecast. So, with Aimee confidently helming on main and staysail, I whipped off Henry’s cover. The spark plug looked clean, but I had a new one aboard, so I gapped it and fitted it to the engine. Lo and behold, Henry sprung into life! We arrived at Carmel Head about 20 minutes late and there were some very big waves just before the head. 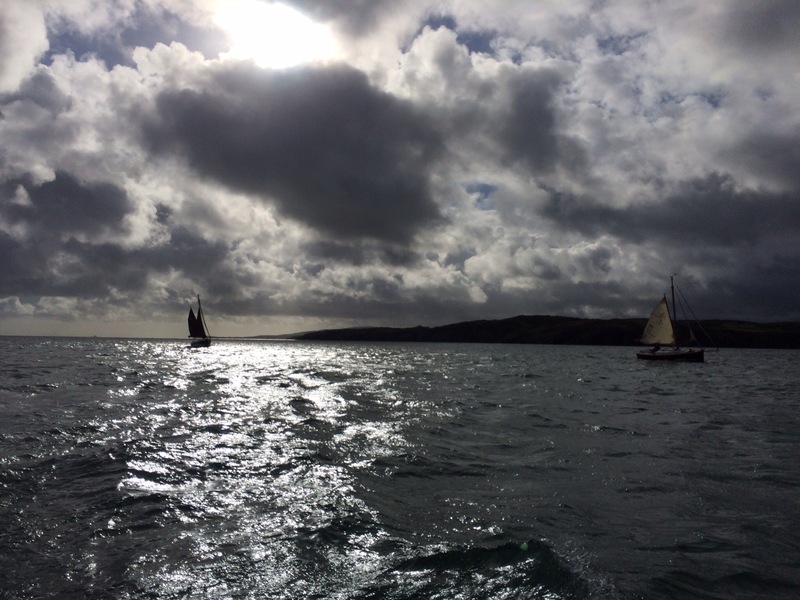 As we approached the head, we came closer and closer head to wind, so we took the sails in. To my alarm, Henry would cough every now and then, but we plugged on and soon could see into Holyhead Bay. I carried on to the West, rather than turning South, because I was worried that if the engine stopped again, we would be uncomfortably close to a lee shore. This proved to be the right call, because after about another 15 minutes, the engine did indeed stop. There was a swell of about 2m from the SW wind of the last few days, but Aurora made good progress, even with the double reefed main. The other three Cape Cutters had taken a shorter course close to the shore and, motor sailing, were travelling faster than us, so we were soon on our own. Beating has been described as travelling twice as far for half the fun, and I think Aimee had had enough well before we got into harbour, though her helming was excellent. We were met by the fleet of gaffers emerging for their race, though only the larger boats (30ft plus) had ventured out into the swell. They made a fine sight and were romping along. No photos I’m afraid, as I had the washboards in and did not want to chance a wave on the camera. Once we were well inside the harbour, I had another go at starting Henry and finally managed to get him started. 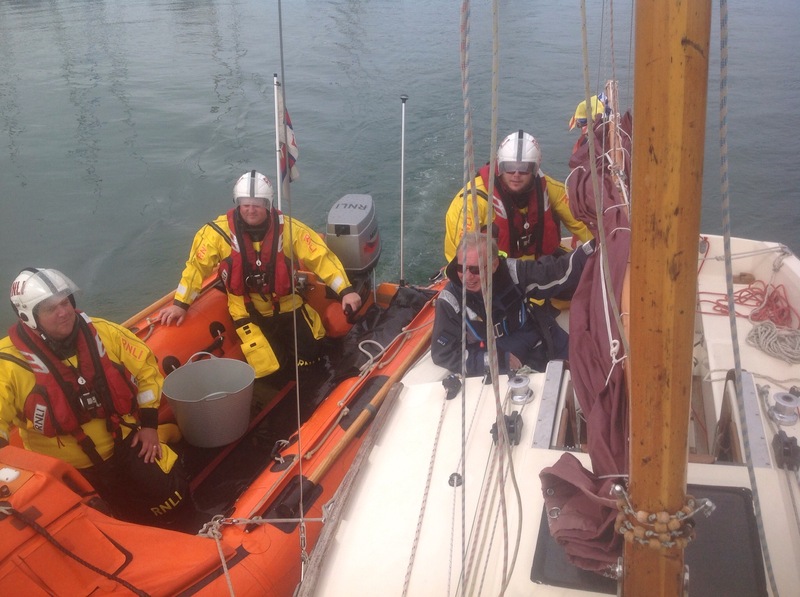 With relief, we took a berth in the harbour and got a well-earned shower. 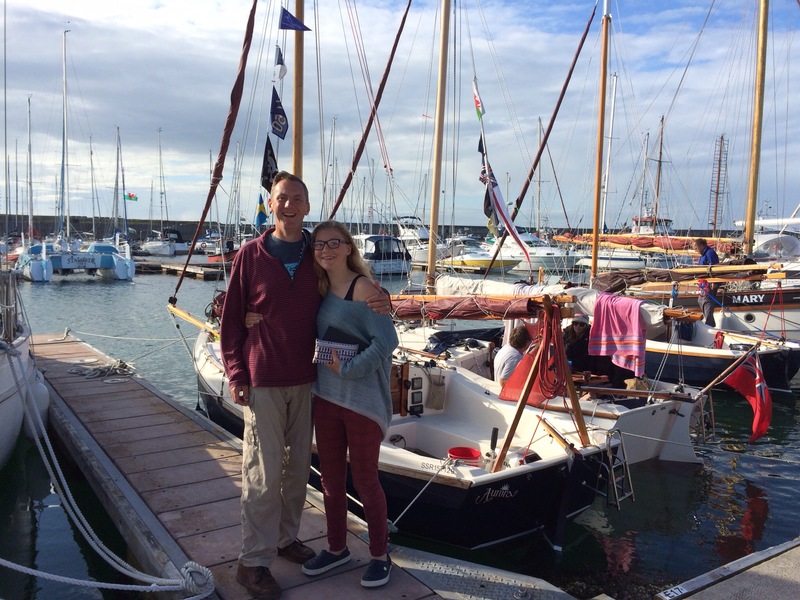 The traditional boat festival is a really enjoyable annual event, with a parade of sail, music and a carnival atmosphere in the marina. 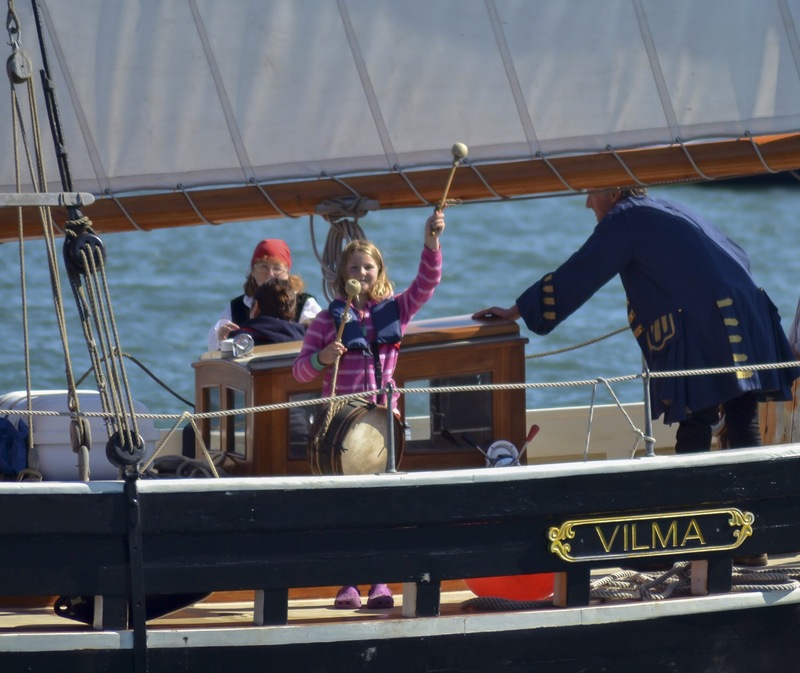 The girls had a great time- to their delight they both sailed aboard Vilma, the “pirate ship”. 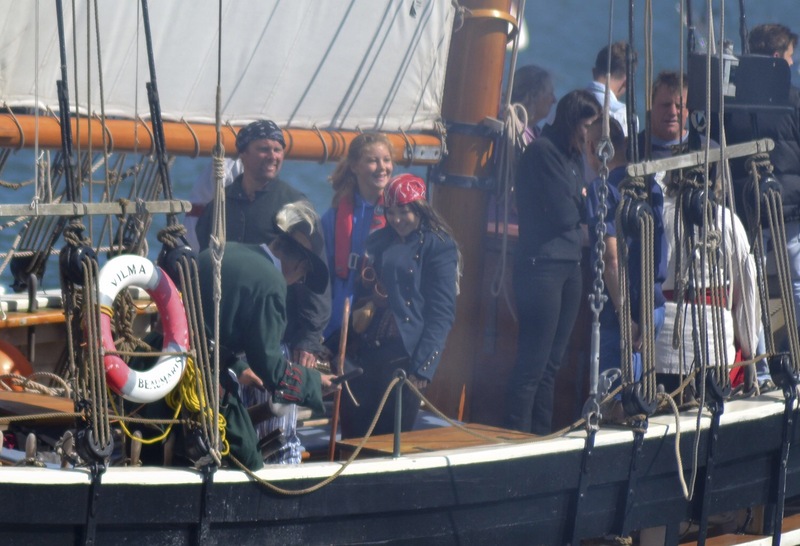 Alice drummed out a beat for the gun crew and Aimee got to fire the cannon. 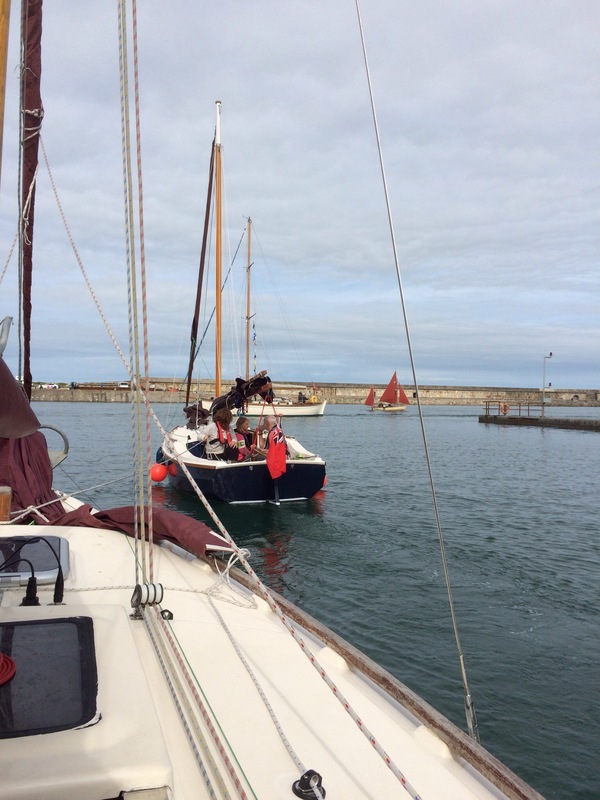 Henry could not be stirred into life at all on Sunday, so we were towed off our berth by Salty Dog for the parade of sail and then towed back in by the lifeboat. I hope I don’t need a lift from one again any time soon. It was on Monday we hauled out for a reluctant return home. A lovely end to the season. When we woke on Friday, to our relief, the wind had decreased much from the F6/7 of the previous day. The forecast was for the wind to rise somewhat during the day, but the weather looked good for us to make for Holyhead, an ambitious trip of some 40 miles. The Menai Straits, which separate Anglesey from the rest of North Wales, runs roughly from SW to NE. It is notorious for its ferocious and confusing tides. Water floods and ebbs from both ends of the straits and can exceed 7kt. In the middle of the straits the narrowest section between the two road bridges is called The Swellies. The channel is at its shallowest here, and the course to follow weaves between large rocks. It has a rather fearsome reputation, but those that know these waters say it is very straightforward at slack water. So it was that we passed uneventfully through the Swellies in the morning sun with a small amount of tide and the wind behind us. 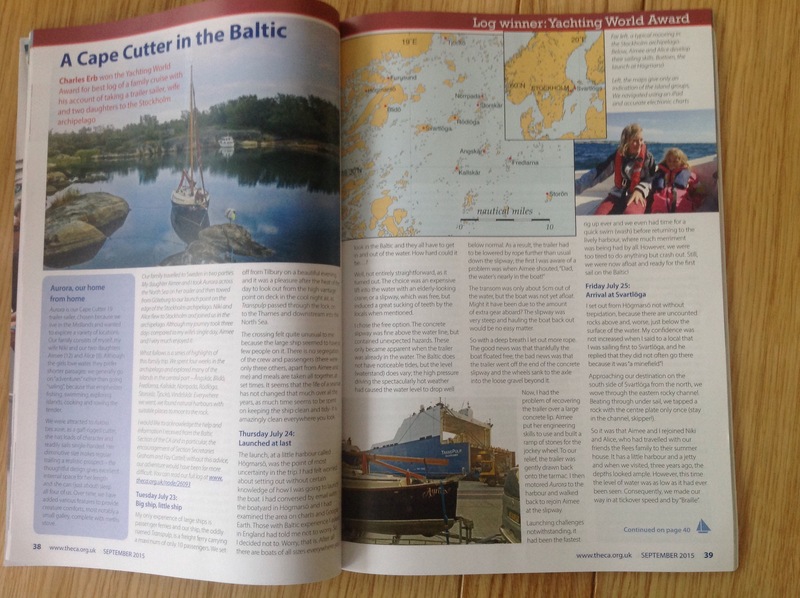 I chose to do this under engine and without mainsail, as the banks are steep and wooded, so it would not be easy to sail an accurate course, though the staysail gave us some additional assistance. 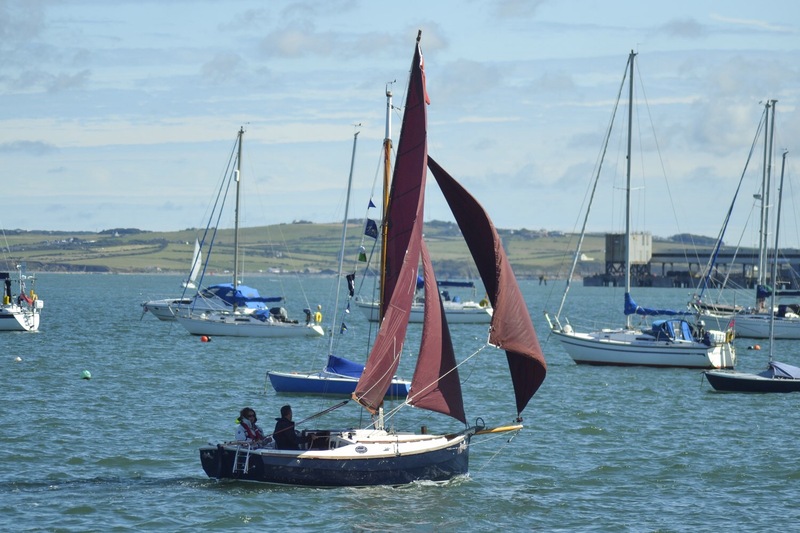 As soon as we cleared the Menai Bridge, I raised the double-reefed main and we ran dead downwind past the towns of Menai Bridge, Beaumaris and Bangor. The weather was truly Welsh, as we started in glorious sun with a clear sky, then a squall of heavy rain passed over us, creating a wonderful double rainbow with a complete arch. The weather was then overcast for a time, and finally the cloud broke up to leave big puffy white lumps of cotton wool spread across a blue sky. At first the double reef seemed over-cautious, and two of our flotilla of four Cape Cutters shook out a reef, but as we neared the end of the Straits at Puffin Sound, it was very clear that double reefed main and staysail were ample canvas. 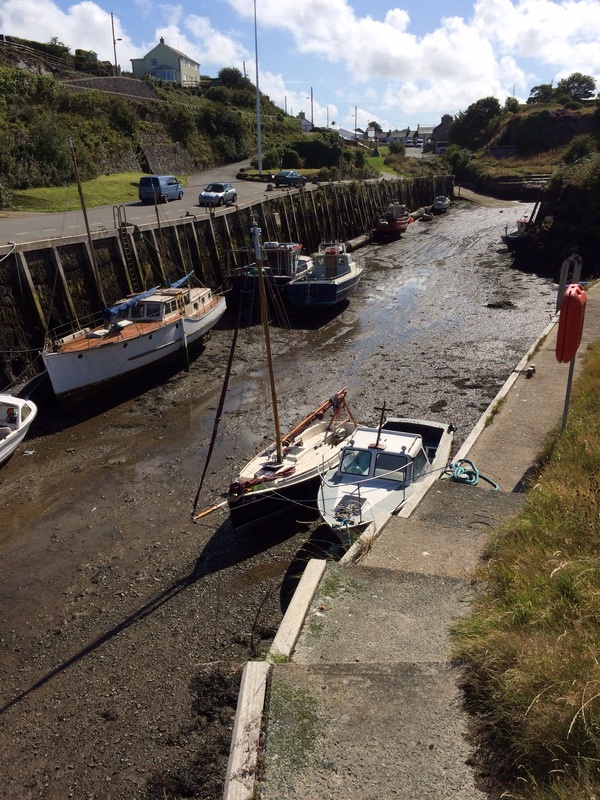 We turned into Redwharf Bay and flew in an exhilarating reach, with the tide under us. This stretch took us about 3nm offshore and we crashed through the swell pitched up by the SSW breeze, which had piped up to F6 by this time. We rounded Point Lynas, which marks the corner of Anglsey, and the beginning of the North coast. We were just about able to fetch along this shore but I knew it would inexorably become a beat by the time we reached Carmel Head, the most difficult section of this hostile shore. By this time, the wind had increased further still. I decided that it would not be safe to continue, as the breeze was continuing to build. 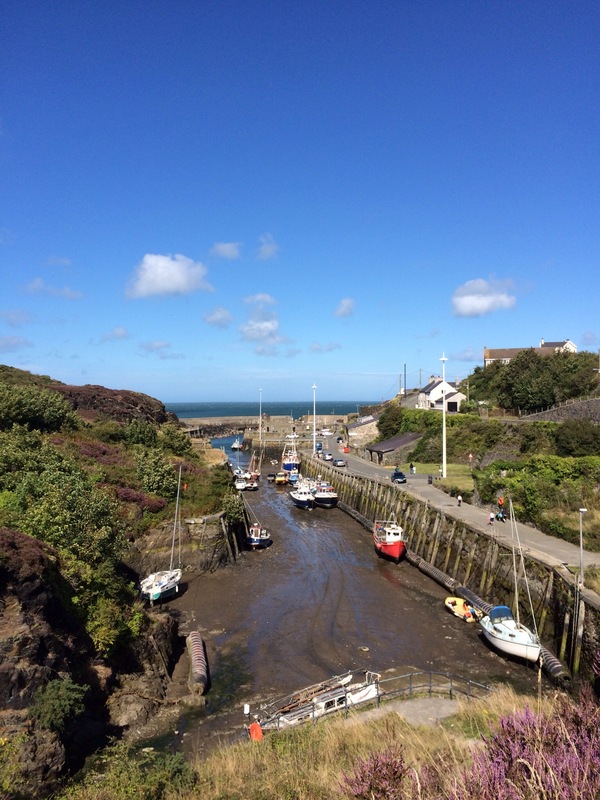 There are few refuges on that shore and the best choice is Amlwch (approximately pronounced “Am-lock”), which is sheltered for winds in all directions. As we got out of the swell and into the lee of the shore, to my horror the engine died. Henry Honda has never let us down, but I could not spin him back into life, despite much enthusiastic tugging of the starter. I quickly dropped the anchor, to make sure we did not drift back out to sea. 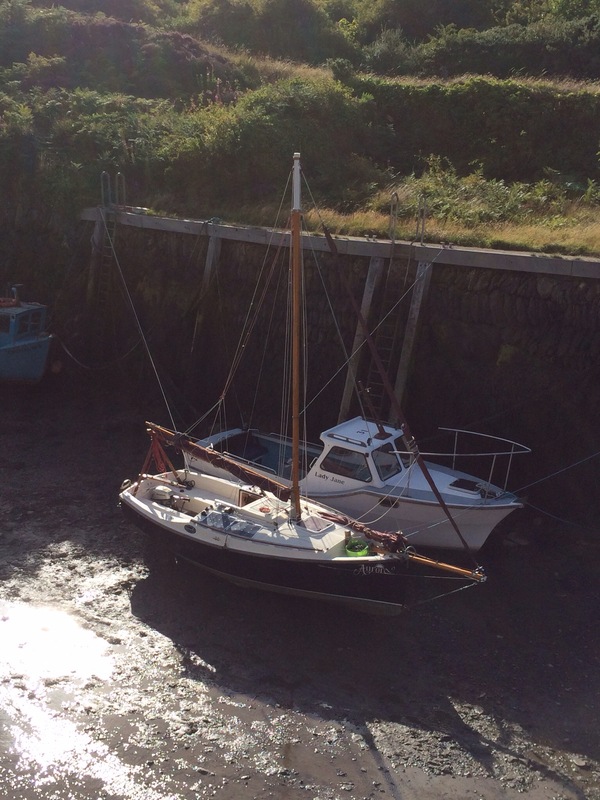 We were only a few hundred yards from the harbour too! The others rallied round and Salty Dog prepared to throw a line to us, but then I finally managed to bring Henry back to life. We quickly raised anchor and scuttled into Amlwych. As the visitor berths seemed pretty full, we chose to raft up in the drying inner harbour. When I checked my track, I noticed that we had drifted considerably in our short time trying to restart the engine. I had forgotten to check the depth before dropping anchor and had not realised the water was very deep, despite us being so close inshore. A lesson learned!